Spring is here! We've been having some beautiful weather here in southern California and I love being able to do my training outdoors. With spring in full motion and summer just around the corner, wedding season is in strong force. 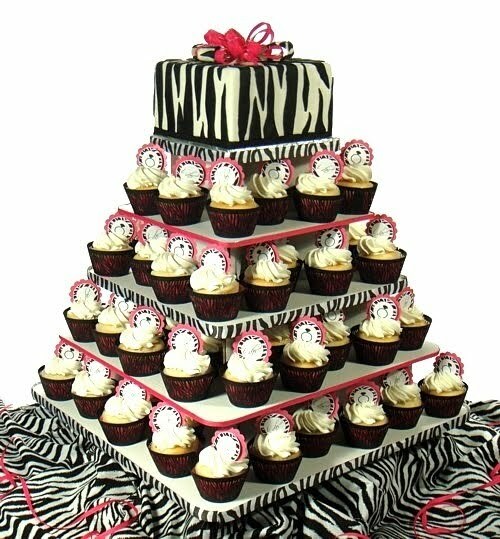 And since cupcakes are the the most exciting new trend at weddings, what better item to have a giveaway for than a cupcake stand! Introducing: the Eco-Cupcake Stand! 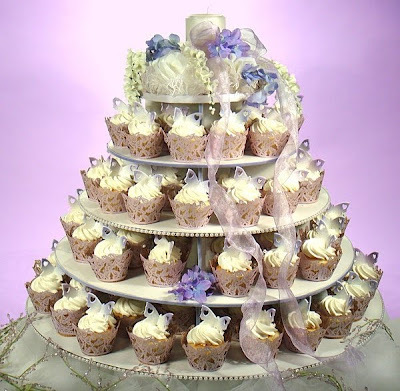 "With the Eco-Cupcake Stand, we have produced a reusable (double sided polished wipeable surface), recyclable cupcake stand made of pristine, recycled sturdy corrugated cardboard. It is lightweight, and easy to assemble and store." "The Eco-Cupcake Stand comes in square and round and form a perfect design platform to extend the theme of any wedding or other celebration....[The Eco-Cupcake Stand] can display up to 200 cupcakes for the round design and up to 125 cupcakes for the square design." The Eco-Cupcake Stand has 5 tiers and is 20" tall. The stand is sold by Greenpartygoods.com, a website that features an array of guilt-free, eco-friendly gifts and tableware. Like what you see? Want to win an Eco-Cupcake Stand? Today's your lucky day...well, actually Sunday might be your lucky day. I'm giving away a square or round (your choice) Eco-Cupcake Stand! How can you win one? Just leave a comment telling me your favorite summertime cupcake flavor. 1. Contest opens Monday, May 10, 2010 at 6:00am PST and closes Sunday, May 16, 2010 at 11:59 PST. 2. Contest open to US residents only. 3. One entry per person per day. Hmmmm, mine would be strawberries and cream cupcake! Or any kind of cupcake since I love me some cupcakes!!! Vanilla vanilla, believe it or not! Yum! Cool stand! Thanks for offering it! a nice light fluffy vanilla with a fruity buttercream frosting! I'm going to tweet this now!! Definitely anything with strawberry. Preferably Strawberry Swiss Meringue Buttercream! Yum! Vanilla/blueberry with blueberry cream cheese frosting! Banana with peanut butter frosting! I love yellow cake with chocolate buttercream frosting. Yum! I've been thinking about orange creamsicle cupcakes. Sounds so refreshing. Fun! Well I just premiered a black forest cupcake with cherries and fresh whipped cream on top which served as a nice,light alternative to the usual buttercream frosting. My favorite summer food is strawberries, so I'd have to go with strawberry cupcakes! It's got to be strawberry. Sprinkles makes a divine one! lemon coconut! lemon cake with coconut frosting, YUM! I have to say red velvet is always my favorite, regardless of the time of year! my favorite summertime flavor is lemon! I love strawberry cupcakes too! Oh, I would LOVE to win that -- so cool an I would use it ALL. THE. TIME! PS I tweeted about this, too! summertime favorite? i just made a crazy one - Banana Pound cake cupcake, mango-lemon icecream "frosting" with blood orange syrup. YUM! Sitting here sipping on my iced tea makes me wonder if a lemon tea cupcake might not be a good idea. Very summery. My other fav would have to be a banana pudding cupcake! Pinapple upside down cupcakes with buttercream frosting...served with Sprite...Yum! Love the stand, this blog, and all the flavors posted! My summer fave is vanilla cupcake, vanilla frosting topped with a strawberry! I forgot we could enter once a day! Oops! I also am loving the tres leche cupcakes I just made! Another great option might be Smores. Perfect for sitting by the campfire. i also love banana and peanut butter cupcakes!